members on January 23, 2016. 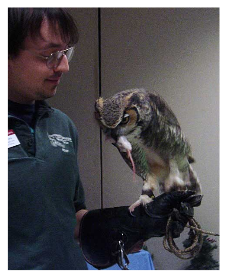 Our visit began with a 'raptors on the glove' program presented by interpretive naturalist Dan Hnilicka, who introduced us to an American kestrel and a great horned owl. Next we took a short tour, where we saw a variety of other raptors including several eagles, a turkey vulture, and a barred owl. 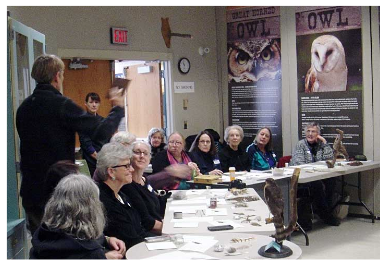 With that introduction to raptors and their natural history, we started the carbon dust workshop with Carlyn Iverson, noted science and nature artist. Everyone got situated at tables set up in a semi circle facing a beautiful peregrine falcon, graciously perching for our inspiration. 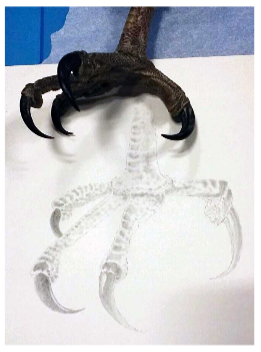 From a variety of unique raptor artifacts such as talons, wings, and spectacular feathers, we chose subjects and within minutes settled into that artist-in-the-zone quiet as we all focused on our works in progress. Carbon dust offers a sense of sculpting, and it wasn't long before impressive results started emerging! Time flew, and many agreed we could have made an entire day of it!